Update: Click here to watch the presentation. Baby Milk Action will present information to the All Party Parliamentary Group (APPG) on Infant Feeding and Inequalities in the UK Parliament on Tuesday 17 May showing how baby milk marketing regulations are being broken with apparent impunity by major companies and will set out action that can be taken. On the same day Session 72 of the Committee on the Rights of the Child will begin in Geneva and will examine the extent to which the UK Government is meeting its human rights obligations. In its 2008 report the Committee stated that the marketing regulations are “inadequate and that aggressive promotion of breastmilk substitutes remains common”. Governments since then have failed to act on the Committee’s call on the UK to implement the International Code of Marketing of Breastmilk Substitutes and subsequent, relevant Resolutions of the World Health Assembly (the “Code”). Last week (9 May) a new report from WHO, UNICEF and IBFAN on state of Code implementation assessed the UK as having “few provisions in law”. MPs from several parties have signed Early Day Motion 1189 calling for the existing Infant Formula and Follow-on Formula Regulations (2007) to be enforced. No prosecution has been brought under these Regulations, even though companies and enforcement authorities sometimes acknowledge they have been broken, as in promotions of Nestlé SMA infant formula across the Tesco chain at the beginning of the year. 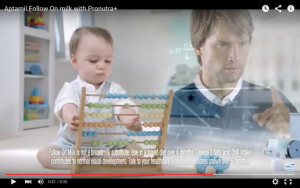 Baby Milk Action points out that if companies followed the marketing rules and did not spend a fortune on clinical representatives to target health workers and promotions such as misleading television advertisements then formula could be permanently cheaper for those parents and carers who use it (an example from Danone below implies its formula helps babies develop mathematical skills). The presentation is timely as new European Commission Delegated Acts regulating formula and baby food marketing are being introduced and MPs have the opportunity to ensure they are better enforced than current regulations. Action in Parliament is essential as the Department of Health’s proposed Statutory Instrument for implementing the new EU Delegated Acts may decriminalise aspects of the regulations, which would be a retrograde step. However, the European Commission regulations, like current regulations, fall far short of the minimum requirements the UK Government (like other EU Member States) has backed at the World Health Assembly, the world’s highest health policy setting body. The International Code of Marketing of Breastmilk Substitutes was adopted in 1981 and the UK government has repeatedly endorsed it through the adoption of subsequent Resolutions that address new baby food marketing practices and changes in scientific knowledge. An expert report launched in Geneva assesses government action in implementing the Code and Resolutions and shows the UK has introduced “few provisions in law”. 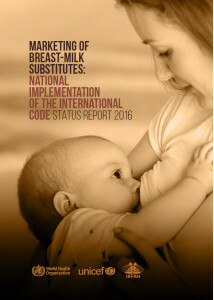 The report Marketing of Breastmilk Substitutes: National Implementation of the International Code – Status Report 2016 was produced by the World Health Organisation (WHO), UNICEF and the International Baby Food Action Network (IBFAN). Mike Brady represented IBFAN at the report launch (video online).